After a successful stint with the iPhone 3G, Apple is now ready to ship the third generation Apple iPhone 3G S in markets from June 19. 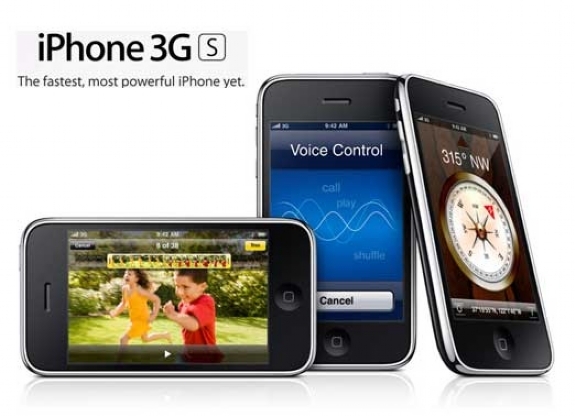 Apple unveiled the iPhone 3G S on Monday, 8 June 2009 at the World wide Developers Conference in San Francisco. Apple is proudly claiming that the third generation iPhone will two times faster than its predecessor in any application that you will use on the iPhone 3G S.
Interestingly ‘S’ in iPhone 3G S stands for speed and claim that it will be two times faster justifies the name well. At the conference Apple preferred to be secretive about the tech specs of the new iPhone. The official carrier of the iPhone 3G S in Netherlands, T- mobile accidently unveiled the tech specs on Wednesday. It posted a product page and with it the specs of the third generation Iphone. The new iPhone 3G S is here to take it competitors by storm. The Blackberry Bold and the latest Palm pre are already in the market and will surely face tough competition from this mobile device. The new iPhone is believed to be powered by a 600 Mhz CPU and has 256 MB of memory to support multi tasking easily. The Palm Pre has the same Tech specs but the X factor that the iPhone has makes it a sure shot winner. The iPhone 3G lacked some basic multimedia features like video recording but the iPhone 3G S comes with an upgraded 3.2 Mp camera with support for video recording. The iPhone 3G S is powered by a 65nm feature size SOC ARM Cortex A8 CPU which consumes considerably less power. It also has an efficient graphics processor giving an enhanced 3D experience while playing games. Also Apple has promised that the third generation iPhone will have a better battery life than the predecessor which is contrary to the fact that more RAM, bigger CPU and new GPU will consume more power. Well we can wait for the day Apple ships its first iPhone 3G S. It will really be the fastest smart phone ever! my iPhone was actually a gift from my girlfriend. i really love this phone and i think that this is the best phone that money can buy. i like the features and the design.